Navy Wife Life: Batter Up! 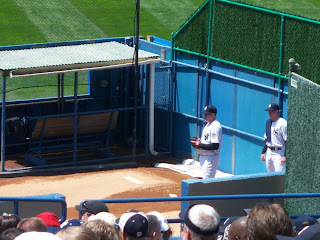 So the hubby and I met up with our buddy Phil to see a game at Yankee stadium. This was the best I could do with all the construction going around. 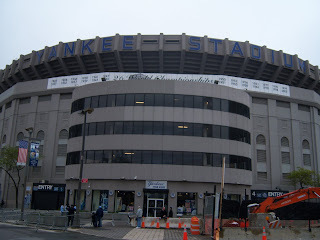 But what's a blog about Yankee Stadium without a picture of the structure? Originally we were going to take the train in from Connecticut, but decided to it might just be easier on us to drive in. It was actually. It took us about three hours, not that big of a deal for us, and we found the stadium pretty easily. 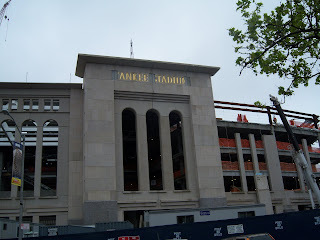 I was a bit worried that we wouldn't be able to find parking with the construction of the new Yankee Stadium going on, but those fears were unfounded. We found a parking garage and only paid $17 for the day. We were quite pleased as we had been expecting to pay somewhere in the neighborhood of $30. It was good to see Phil again. 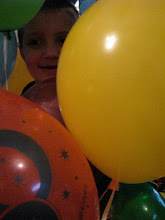 He had been in New York since Friday and met up with us. We knew to look for a Yankees cap and jersey to find him. 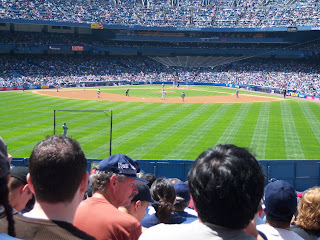 Kind of hard in the sea of Yankees garb that surrounded us. But Phil told us where to meet up and all was well. We had bleacher seats in center field. I'm not sure who's warming up in the bull pen. You'd have to ask Phil. The Yankees are his team, not mine. But I did cheer for them at this game. I did take this picture from our seats with the help of the zoom lens. This is how the game looked to me. We were expecting it to be a slightly chilly day, but it ended up being a warm, sunshiny day. In fact I got a bit too much sun and am a nice shade of pink. Wasn't thinking about sunscreen. Of course they weren't predicting 70 plus degree weather either. 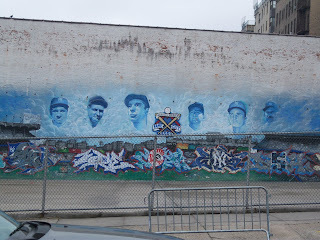 Before the game we wandered around a bit. Got to explore, it's just a must! So I just had to get a shot of the stadium facade that wasn't yet complete. I know I'm weird, but I'm okay with that. I liked the artwork on the side of this building. I just wish the fence wasn't in the way. It was a parking lot, so I kind of understand the fenced in bit. Phil said it would make a wonderful stick ball field. Oh yeah you might want to know about the game. The Yankees won against the Mariners. Eight to two. They don't serve beer in Yankee Stadium and I can understand why. There are some of the most obnoxious fans there. They like to curse and they don't care if there are small children around. My only regret is I didn't get a picture of all of us together.